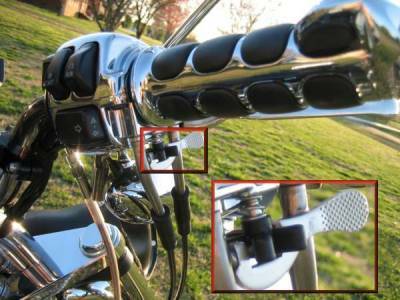 Throttle Lock Levers for Harleys - Throttle Lock Cruise Control Levers that look great and work like a charm! 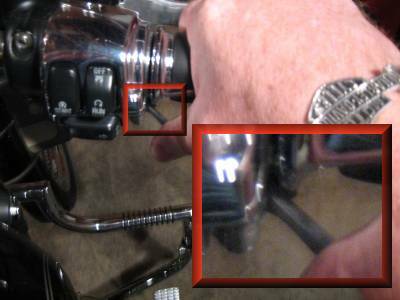 This simple, quick, easy to install Throttle Lock Cruise Control Lever fits all Harley-Davidson Motorcycles that have the factory installed star thumb wheel screw. 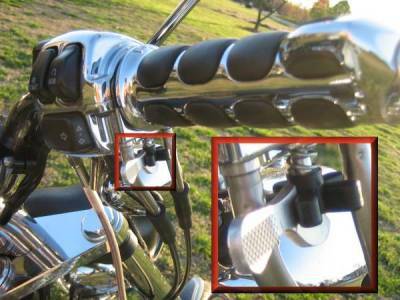 NOTE that if your Harley has the barrel style thumb screw you must order the barrel style throttle lock lever without the teeth made just for barrel style thumb screws. Otherwise you will receive the normal Star Style. This is precision crafted from polished aluminum with a stainless steel set screw and can hold up in any weather condition. Designed to hold the throttle at the desired RPM easing stress on your throttle hand, it still is over-ridable and easily adjusted - even with heavy gloves! Easily installed with one set screw. You can be ready to hit the road in as little as one minute! Give your throttle hand a break! This is especially great for the long rides to the bike rallies! After using this you will wonder how you ever got along without it! You probably let your clutch hand rest occasionally on your thigh going down the road so doesn't your throttle hand deserve a break, too? A drop of blue loctite is highly recommended for installation of Throttle Lock Levers and other parts you have on your motorcycle. The vibration loosens things (especially on Harleys) & this will help prevent those items from getting lose or lost on your ride. I also offer thumbwheels, friction springs, and friction shoes in case your old originals that came with your Harley need to be replaced. The prices below for these parts include shipping when shipped with your purchase of one or more Throttle Lock Cruise Control Levers. If you don't purchase a Throttle Lock Lever, then you would need to add shipping cost to your shopping cart. Special for the month of - THE THROTTLE LOCK LEVER PRICE INCLUDES FREE SHIPPING W/CONFIRMATION NUMBER. Within a day or two after payment is received and your package is ready for shipment you will receive a SHIPPING NOTICE email and electronic confirmation number with link so you check the delivery status online. Insurance is optional, but highly recommended in case something ever happens to your merchandise while in transit. SHARE YOUR PRAISES FOR THE THROTTLE LOCK LEVER & GET YOUR STORY & BIKE'S PICTURE PUBLISHED ONLINE FOR FREE! PARTS: The prices below for these items include shipping when shipped with your purchase of one or more Throttle Lock Levers. However, If you don't purchase a Throttle Lock Lever, then you need to add shipping cost from below to your shopping cart. SHIPPING: Get FREE SHIPPING with the purchase of one or more Throttle Lock Levers. However, If you don't purchase a Throttle Lock Lever, then you need to add a flat rate shipping cost from below to your shopping cart. One rate for as many items as you order.